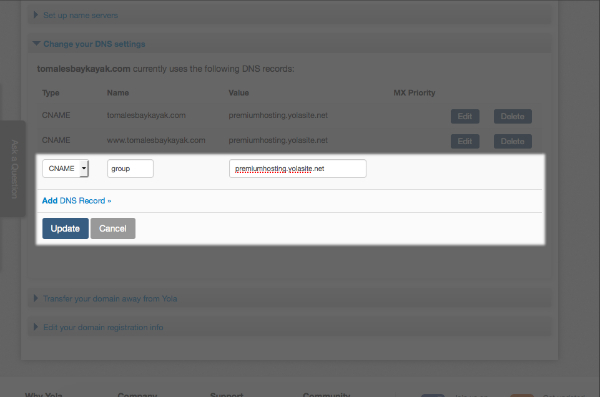 If you have a domain purchased from Yola, you can create subdomains using the Advanced Domain Settings to set up CNAME records. Please note: Changing your domain settings can result in your site no longer working. Please be sure you understand the consequence of the changes you are making. Click Domains along the top toolbar and then click Advanced settings next to the domain you want to edit. To access the CNAME records, click Change your DNS settings. To add a CNAME record, click Add DNS Record. Select "CNAME" from the drop-down menu for the first CNAME record. Under "Name" add the subdomain you would like to use (e.g., "group"). Click Add DNS Record to add a second record. Select "CNAME" from the drop-down menu for the second CNAME record. When the above steps are completed, please send an email to support@yola.com with a request to publish your site to your custom subdomain. Please remember to specify the site and the subdomain. Once published, your subdomain will be available as "group.mysite.com" and "www.group.mysite.com" (replace "group" with your subdomain name).